Connie Buskohl CPA has offered quality client-centered professional care to clients for over twenty years. 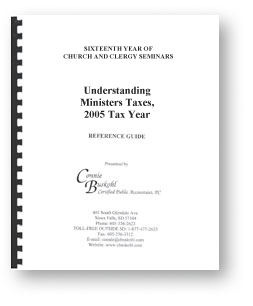 Pastors will gain a better understanding of clergy-related issues that pertain to the church and their taxes. Church treasurers & board members will learn appropriate ways of setting up compensation packages and accurate preparation of payroll reports and W-2s.